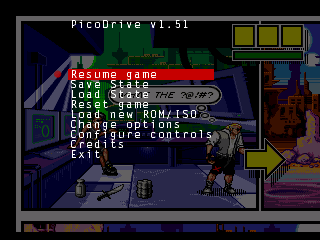 PicoDrive with MegaCD/SegaCD support. This is the official Caanoo/GP2X/Wiz release. Great job! Stable, fast and very easy to use. With megadrive roms work well, but with some segacd games I have problems. Just like Kyosaeba, it's perfect. Impressive! This emu is awesome, big thanks! Awesome, thanks a bunch :! This is the most flawless emulator I've seen for the wiz! This is probably the best emulator for the Wiz... Unfortunately I can't start Soul Star (Mega CD), after the intro screen the game freezes (black screen)... anyone knows if there's a way to make it work? I solved the problem with Soul Star ... the USA version doesn't work, while the Euro version works fine! Star Wars Rebel Assault for SEGA CD has big problems. The game locks up completely in several levels. I literally could not beat the game. Did everything I could. Also, Adventures of Willy Beamish locks up right before the frog race is supposed to begin. Had to turn the sound off in order to get past that. Otherwise, this is literally the best Genesis emulator I've ever played in my life!!! Any chance of 32X games being added to the mix?? I don't know, but the 32X add-on use a dual 32 bit RISC processor (Hitachi SH2) as main CPU and I think that the emulation is too difficult for the Pollux SoC. Yeah, I don't know how it all works, so I trust you. There's an emulator on PC called FUSION that emulates all three consoles, GEN, SCD, 32X on the same one. I wonder how that one pulled it off so well. Wonderful emulator! Strong and stable...class act all the way. Thank you!! how is Eye of the Beholder on this? I would pay money for this!! Is there a "PAYPAL" button for its creators?? Seriously, they deserve to get some dough thrown their way for this. This is by far my favourite Sega emu. I've used it since I got my F-200 and now with my Wiz. The only problem I have at the moment is that Lunar: The Silver Star locks up after the opening screen. That may be a bad ISO though because Lunar 2 and VEY work perfectly at 533Mhz. Great job and thanks for all the effort. @ Darkn00b1971 - Yeah, I am guessing you have a bad ISO. I don't remember having a problem with that game. Then again, I never play those games, so I can't remember if I successfully tested it. Found a game that fails to work right. :( On Dungeon Explorer for the SCD after you beat the first dungeon the screen stays blank. It could be a bad iso, but I'm not sure. This is the only game I've found so far that does this. Amazing emulator! This is a perfect work of art, not just an emulator! Thank you! Great emulator, but I cant play Megarace and Tomcat alley. The games run, but the opponents will not be displayed. So I cant shoot them. Is there a problem with the emulator or with the bios ? Thank you for Master System support. Great to see some Master System(although not perfect), Golden Axe Warrior has minor graphical bugs, but other games I played seem fine. Was there originally a start button because I can't pause or access in game menus. Overall improvement though, can't wait for the next release! Yes, but it did the exact same thing as the B button in most cases. So on the Wiz, it'd be whatever you have set up as B. A lot of GG games actually didnt pause or have menus. And I also did see graphical bugs with Golden Axe Warrior - weird green things that flickered behind some NPCs in rooms. But over all, it's the best GG/SMS player for Wiz despite it not being finished! I found that the start/pause button worked for the games I tested in Alexkidd but not in Picodrive, none of the configurable buttons will work as a pause/menu button, which render games like WB3: The Dragons Trap as useless due to not being able to access inventory. But still for the first time of having sms games running, they run fairly well. This has been updated!?!?! How come I didn't see "updated" in the front WIZ menu. Haha, I didn't even know! Gonna download now! A suggestion for Sega Master. In the game Black Belt, there's a trick for getting infinite lives. On the original Sega Master game deck, right after you start the game and the big red screen shows your lives, you hold down the reset button as the screen goes black, and you'll see this bizarre animation, and then it begins the game with infinite lives. You need to be able to warm reset in order to do this, which is why you can't do it on the Genesis power base converter. Hmmm, ok, I was hoping this was going to make Game Gear games full screen and make me throw away my Game Gear for good. But I loaded up Shinobi for Game Gear and this thing isn't working. The color is screwed up, the full screen stretching doesn't work. Also, I can't start the game. Because there's no button configured for Start. I'll have to figure out how to switch that, I guess. @dogeymon: Go to the settings while in a gamegear/sms game, they're separate from the standard genesis settings. set the horizontal and vertical displays to "software stretched," and then set the color depth to 8-bit accurate and you're golden... although I haven't tried Shinobi for GameGear myself. @ darmakwolf - I know about the stretching selections, and I appreciate them, but they don't really work for Game Gear. It doesn't stretch the game. It actually just stretches the background color, not the actual game. As for Sega Master, it did stretch out the alex kidd games I tried out. But sadly, the image quality is not perfect. It's kinda uneven. And it doesn't format it specifically right, sometimes the score is cutoff at the top a wee bit. It's almost perfect. Saddest of all was Virtua Racing 32X. I tried it and it's way too slow to be playable. I fiddled with some settings in the menu, but it didn't help. I would love to paypal donate to the project or something! GREAT WORK STILL! @ darmakwolf - The background color for Shinobi Game Gear, by the way, is supposed to be white, not baby blue like in the emulator. Yes, I see what you mean. GG games are .. lacking. Some are even inverted colors (lol.) But at least SMS is near-perfect, and gg is clearly on its way. PicoDrive is still in my opinion the highest quality emulator for the Wiz currently, and perfect SMS/GG will be much appreciated. Does the developer have a site set up to donate money? @ Darmakwolf - What's going on here? Sometimes you post with a lower-case letter at the beginning of your name. And sometimes a Bigger-case. Are you you? There's a paypal donate button at the top of this website screen. But I don't know where that money will go. Actually, it seems like you can use any combination of upper and lowercase letters as your login each time. It just depends on whether or not I feel like capitalizing my name. lol! @ (D)darmakwolf - Hahahaha, ok.
@NOIZ: ... ... I hope you're joking. GameGear was awesome. Sure, Master System had clones or even upgraded versions of GG games, but they weren't exactly the same. There were some good GG games - in fact I still have my system! Also, I expected 32X games to be slow. I can imagine it's exceptionally difficult to emulate. @DarmakWolf: If you had a GameGear, it is surely interesting to have GG support in PicoDrive. It was unthought by me. So sorry. But for me, who never had my own, it isn't interesting. @DarmakWolf: I tested some GG games now. Funny to play. But no screen resize (AlexKidd) or inverted colors and missing Start button (PicoDrive). :( So i'll stay with SMS and MD. GAME GEAR versions of SMS games are better for a portable game system because they're formatted for a small screen. Characters are bigger, easier to see, etc. On the WIZ, I would prefer Game Gear games to play full screen, and properly, actually. Also, if this ever gets updated, please make it possible to soft reset a game, so we can do the infinite lives cheat for Black Belt for SMS.